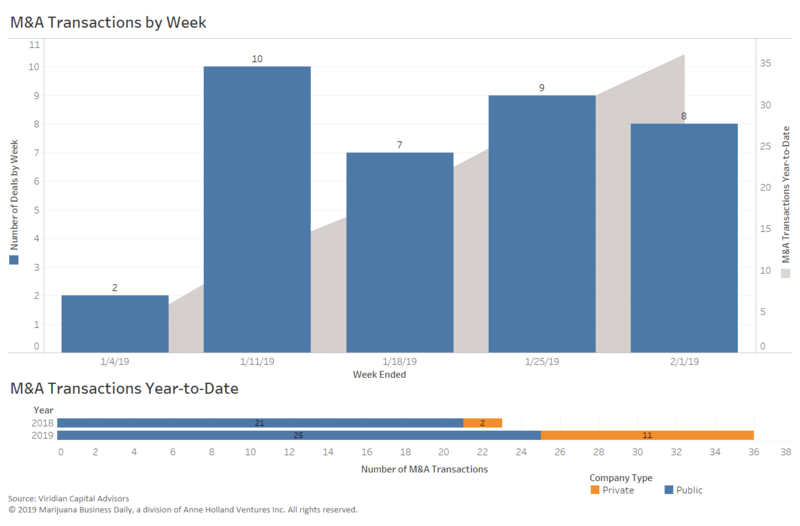 Below is the latest data on cannabis investment activity and M&A, along with key takeaways, analysis and trends from Marijuana Business Daily and Viridian Capital Advisors. 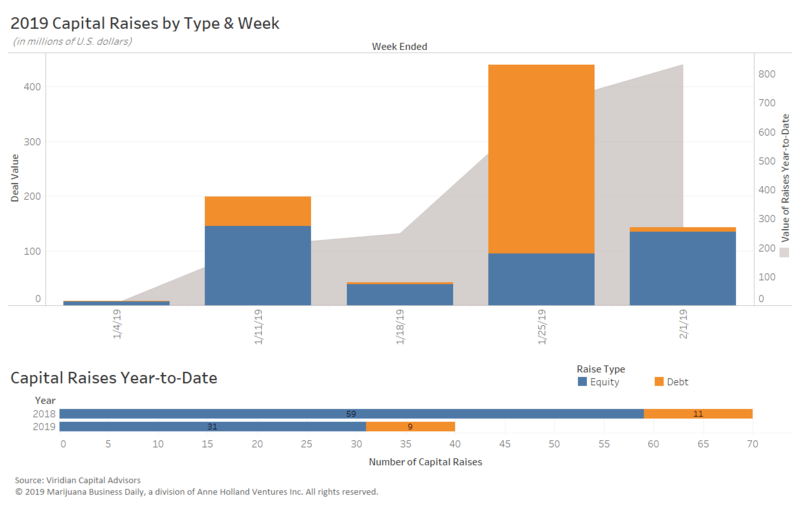 The data, provided by Viridian, is through the week ended Feb. 1. After the passage of the Farm Bill, U.S.-based hemp companies are racing to raise capital – and finding success. Oregon-based Socati Corp. closed a $33 million funding round, capital the hemp producer plans to use scale its manufacturing operations. The funding round followed an earlier raise of $9 million. North Carolina-based Lazy Gator’s Hemp Farm secured a $165,000 raise. While the round was small, the company has been approved to raise up to $30 million. “We’re starting to see more and more interest in these hemp farms because they are pretty well defended now thanks to the Farm Bill,” Phillips said. Consolidation among cannabis operators continues in Canada with Calgary-based Westleaf (TSX: WL) closing its acquisitions of Canndara Canada in a deal valued at more than CA$48 million. Massachusetts-based TILT Holdings closed a $40 million deal to acquire Standard Farms, a vertically integrated operator in Pennsylvania whose products are carried in 95% of dispensaries in the state. “U.S. operators continue expanding into new states to develop infrastructure footprints,” Phillips said.